To foam roll or not to foam roll, that is the question. As an expert in myofascial conditions such as neck, upper/lower back pain, knee and foot pain, I say everyone should be doing some sort of myofascial release on themselves regardless of activity level. Have you ever noticed an elderly person walk? Sometimes they’ll shuffle their feet instead of taking full steps, or they’re really hunched over. You don’t want this to be you, trust me. Not only is it uncomfortable for a young person to be injured, add on being elderly to the mix and that makes for one life of misery. Of course, you already know I’m going to say get acupuncture regularly. I recommend acupuncture not only as a practitioner, but as a patient. There’s is such sweet relief in having tight muscles released with acupuncture. It’s better at this than any other modality out there. All of these elements are necessary to grow old comfortably. Barring a medical condition, like spinal stenosis for example, you will age comfortably if you take the time for self care and get body work done regularly. Some other options are massage balls and foam rollers. I highly encourage my clients to get massages whenever they feel it’s appropriate, but my go to foam roller is by Intelliroll. (I don’t get any money from them if you buy one, I just really like it). The reason I like it is because it has that space in the center for the spine to settle into. Whether you’re a CrossFit fanatic or a desk jockey that doesn’t get to do much because of work, it’s always a good idea to end the day with a little self massage using the foam roller of your choice. A foam roller can help relieve neck tightness from staring at your phone and computer all day long, tight hamstrings from sitting all day and more. My only advice is, DO NOT FOAM ROLL HARD! I literally have to treat people who have wrecked their bodies foam rolling too hard. AND NEVER FOAM ROLL THE IT BAND. It does NOT need it. You can foam roll the hip and gently roll it down the side of your thigh but there is no need to press the IT band into the foam roller. You’ll get more out of foam rolling if you let your body settle into the roller naturally and breathe. For a great example on how to foam roll, check out this YouTube video. She does go over the IT band but you’ll notice, she’s not digging into it. Now get to working on your fascia! If you don’t already use one, add a hyaluronic acid serum to your skincare routine. It should be the first thing you apply after cleansing you face. Then layer your oil, if you use one, then your moisturizer and end with your SPF cream. Most of us get lazy about exfoliating over the summer so come fall/winter, we have to get really good about that. Exfoliate 1-2 times per weeks using, an enzyme exfoliant, to remove dead skin cells, which allows your products to penetrate and absorb better. If you’re doing it twice a week and notice you skin is a little irritated, scale back to once a week. DO NOT be afraid of oil! It’s the number one thing I recommend to hydrate your skin, giving it that youthful glow and bounce. Oils are great for everyone, my favorite is Dr. Alkaitis’ Organic Nourishing Oil. It protects your skin from cold dry air and bacteria, it strengthens the lipid barrier (which means it maintains the hydration better) and just so happens to be great for healing acne. Every winter, I sleep with both a heater on and a humidifier in my bedroom. Heat in our homes and apartments can really zap all the moisture out of our skin. There are so many options on the market, I like this one by Pure. Even your office can get dry, so keep a hydrating mist like this one by Josh Rosebrook and spray your face sporadically throughout the day. Also, moisturize both in the morning and the evening. As with anything else, consistency is key. The more often you hydrate, the less chances of your skin drying out. Does Acupuncture work for TMJ? TMJ is short for temporalmandibular joint dysfunction. It's literally a mouthful. I actually have TMJ thanks to a crappy orthodontist I had as a kid. Add on the stress of being an adult and voila I have TMJ. I joke around that I can unhinge my jaw like a snake, but it's actually not funny and quite frankly scares the crap out of me when my jaw locks when I try to yawn. So, trust me, I get the concern about this when it happens to you. TMJ is actually a pretty easy fix as it's caused by tightness in the muscles we use to chew. The cause is almost always stress, some of us are just natural jaw clenchers especially in our sleep. The red areas are usually where you'll feel pain or discomfort when you have knots in those muscles (which is what the X marks are). As you can see, sometimes you'll get an ear ache or tooth aches which when examined by your doctor or dentist, turns up nothing. That's because the knots in your jaw muscles are causing the ear or tooth ache. This is also why using a mouth guard isn't helpful in my opinion. I just don't see how biting down on something is going to provide any sort of release of the jaw, instead it makes it tighter and tighter. I treat TMJ a lot in my practice and get acupuncture for it myself. It's a godsend. It requires releasing muscles of the jaw, neck and sometimes scalp along with points to reduce stress overall. I highly recommend developing some sort of breathing/meditation practice to help you decompress daily. First, let's go over what vertigo is. It's a feeling of dizziness, all the time. It's triggered by certain positioning of your head and probably gets worse when you move your head. There is one super common cause that I haven't mentioned above because, quite frankly, doctors just aren't trained to look for it. It's called a trigger point. A pathogenic knot in a muscle causing discomfort, pain and dysfunction. In the case of vertigo, if you're sure that your vertigo isn't caused by any of the above (except for the head/neck injury) then acupuncture absolutely can help you. In the illustration below, the black X's mark the spots where these knots are. These trigger points cause the muscle to get so tight that it compresses against your aorta, cutting off the oxygen supply to your brain, making you dizzy. It sounds scary, but it's actually not, it's an easy fix! Don't suffer a minute longer than you have to, book your appointment below and get rid of your touch of "the dizzies"
5 ways you're creating back pain without realizing it. One of the things that makes me stand out as a healer is my strong knowledge of anatomy and how our muscles work, especially when you're in pain. I've treated so many cases of back pain and I've noticed that they all have a few causes in common. Below, I share them with you so that you can be a little more conscious of how you move your body throughout the day. Constantly looking down at your phone when you're on the subway, at your desk, in bed (which is the worst) is a huge culprit in neck and upper back pain. Fascia (our connective tissue) gets hardened with repetitive motion like constantly scrolling and typing on your phone. Sleeping on your belly is the worst position for your neck and spine to be in. Lying on your back or on your side with a pillow between your legs is the best way to sleep for your spine to be in neutral position. I know it can feel super awkward to carry your bag on the other shoulder than what you're used to, but it should be done for balance. Better yet, if you're a bag lady, you're better off getting a chic backpack and save your back from pain. I see it all the time on train platforms, men and women shifting their weight from side to side as they're waiting for their train. Standing tall with your weight evenly distributed between both feet is the best way to not throw your hips out of alignment keeping your back pain free. Fascia, our connective tissue, follows a certain pattern on different parts of our bodies. In the front, theres a criss-cross sling on the upper body. The back is completely different, the muscles and connective tissue lay on us as if someone took a paint roller and painted our muscles on us from the heels to the top of our head-it's all one long connected sheath. Sitting for long periods of time, squashes the hamstrings and tightens the calves leading to a tight lower back. Ignore the tightness long enough, and eventually it'll lead to muscle cramping and pain. What helps back pain best? My #1 recommendation for any kind of pain is acupuncture. It gets to the root of what is causing the problem, rather than just band aid it. If needles scare you, then my second recommendation is cupping. Cupping does a great job of relieving tension, pain and loosening fascia. Tight fascia is the problem to begin with, so loosen the fascia and you're going to feel better. Does Kinesiology tape really work for injuries? It all depends on how you use it, or more importantly, what your intentions or goals are with your injury. 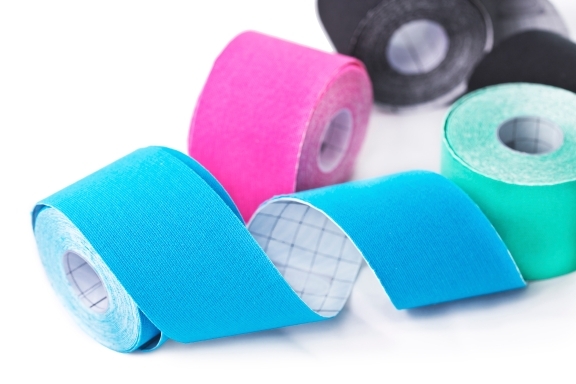 Taping is very popular amongst pro-athletes and oddly in CrossFit enthusiasts specifically, which is why I'm writing about this today. I don't have anything against Kinesiology tape (K Tape), I use it in my own practice on my patients, but very rarely do I ever feel the need for it. For some reason CrossFitters, and other athletes that work out just as hard, are covered in this stuff. My question is...are you doing ANYTHING ELSE to actually treat and recover from your injuries? Is Kinesiology tape enough to treat an injury? If you're relying on K-tape to manage your pain, you'll regret it one day. Try acupuncture instead and treat the root of your problem. No. In my professional opinion, as someone who specializes in treating pain successfully, absolutely not. "Self care" is a term severely lacking in the CrossFit world. I hear about taping and eating Paleo but I don't hear enough about actual self care that goes outside of someone buying a cream, a lotion or tape and seeing an actual professional to treat their injuries. Continuing your workouts while injured isn't a badge of honor, it's simply not smart and you'll regret it one day. I became an acupuncturist because I was in chronic pain and saw several health professionals in desperate attempts to heal my pain. It wasn't until I started getting acupuncture that my pain was finally resolved. This is what drives me to heal other people. I would never tell you not to follow your doctor's or Physical Therapists advice, but understand that K Tape is literally a band aid for your pain. Acupuncture, treats what is causing your pain, your PT can then help you develop better body mechanics so that you move better preventing the same injury from reoccuring. And of course, if your injury is serious enough that you need surgery, acupuncture can help you recover faster. I had a patient with achilles tendonitis. Male, 28yrs old, a former Rugby player who currently stays fit by doing HIT workouts and lifting heavy weights along with some rowing for cardio because it hurt too much to run. Tendonitis is treatable but takes a few sessions because it's most likely a chronic case of it. I've never had anyone come in with tendonitis of any kind as a first inquiry to fix it, they usually see a sports medicine doctor and physical therapist first. The acupuncturist is sadly, usually the last hope in cases of tendonitis which is too bad because we are the ones that do the best job of resolving it. I treated the trigger points responsible for causing the achilles tendon pain and this was a perfect time to use K Tape. I taped his calf so that the muscles remained supported and stretched until I could treat him again. We did this every time I saw him and after 4 sessions he no longer needed the tape and his Achilles Tendonitis was resolved for good. Can it come back again? Yes I think it can if he doesn't take the time to properly warm up and do hamstring and calf stretches after his workouts. As of today, it's been over 6 months and he hasn't needed to treat it again. He can now run comfortably. Do you ever feel nauseous every time you eat? I had a patient come in, a young woman, 26 years old who said she felt like vomiting every time she eats. At first, I thought perhaps she has an eating disorder and this is her way of reaching out for help but she quickly squashed that idea by telling me that she loves to eat and is very active. She boxes and does yoga, along with some other stuff to keep in shape. The impression I got from her was that she was very stressed and food wasn't an issue. She just wants to be able to eat without feeling nauseous. She was tired of people, especially doctors, looking at her funny every time she mentioned she was too nauseous to eat. Her friends kept telling her she was probably just pregnant and she assured me she wasn't. Of course I asked if she had seen a doctor for this and she did. They didn't find anything wrong with her blood work and nothing showed up on X-ray. I asked her to lie down face up and I felt her abdomen. What jumped out at me was how tense it felt, this was why she was feeling nauseous. The human body is more than skin, muscle, blood vessels, nerves and bones. There's an entire network of web-like connective tissue that helps keep all that together. Without it, we'd be crunchy like a potato chip. As a fascia expert, I know that sometimes our connective tissue can get bound up creating constrictions in our bodies. I knew I needed to release the tight fascia in the abdomen for her to feel better. I selected some acupuncture points, released the knots in her rectus abdominus muscles, which is pictured below, and then inserted some needles across her belly very superficially to release the web like connective tissue. I asked her to contact me the next day and let me know if she was still nauseous, I just like to know if I'm on the right track or not. This is a perfect example of how acupuncture can help in a situation where Western Medicine just doesn't have any answers. Common tightness in the abdomen can be found in both men and women who do a lot of core body work such as ball slams, pilates, planks, box jumps, etc and don't take the time to stretch the abdomen, so don't forget it in your daily stretches. If you feel this way and would like help decompressing and regulating your digestion, book your acupuncture appointment below now.